Time jump! Kayoon is now the general manager. Ki-Chan’s company is expanding. Dongsook has her own little restaurant/shop and the newly-weds are coming back from their honey moon! Mansoo and Kayoon are happily managing the restaurant and Ki-Chan delivering…Ki-Chan even has an employee! What a time jump as Jung-Eun and Jingook are supposed to return from their honeymoon. Gasp, even Dongsook is opening her restaurant. Young-Tae invites Ki-Chan to come with him to the opening so that he might see Kayoon and gets caught by Daeho who kicks him for trying to get the two together. Things go by quickly as Dalja tries to be polite to Kayoon because she hopes to take care of Heejung when Kayoon marries Hyunjoon. She does however ask Kayoon to come over and look at the bedsheets as she thinks they are ugly. Kayoon answers that they should be thankful that they are even seeing each other. Ki-Chan agrees that they can wait until the family problems get resolved. Kayoon then stops by Dongsook’s restaurant still wearing Ki-Chan’s scarf. Soon-Im greets Kayoon happily but Daeho arrives and gruffly dismisses Kayoon before Ki-Chan arrives. Kayoon quietly obeys. However, Soon-Im follows Kayoon out to tell her that she missed Kayoon. While Soon-Im is out, Dongsook asks Daeho if Jingook isn’t arriving the next day and Minwoo starts crying…Something is wrong as Minwoo even wets his pants. Daeho calls Heejung to tell her about the incident. Heejung stands firm that she’s not going to let Jingook see Minwoo and hangs up. Meanwhile, Kayoon brings a new comforter to Dalja. She asks if Dalja is fine with the new sheets. Dalja snaps that the current problem is not the sheets but leaving Heejung at the company. Dalja adds that Heejung acted suspiciously when they mentioned Hyunjoon at the beginning of Jingook’s engagement… She warns that Heejung might try to get involved in Jingook’s relationship again. Ki-Chan hears about the change in ownership of Hyunjoon’s restaurant and rushes over to confirm it with Hyunjoon. Hyunjoon reassures him that the restaurant chain will not change seafood distributors but then changes the topic to declare that he’s getting engaged with Kayoon. Ki-Chan answers that he only came to discuss business and leaves. However, Ki-Chan runs into his sister in the lobby and she hears about the change in ownership. She drags Ki-Chan into her office and warns Ki-Chan that he shouldn’t compete with Hyunjoon who is capable of creating a successful restaurant chain to get his father’s approval. She notes that Hyunjoon can easily crush Ki-Chan if Hyunjoon wanted. Heejung then goes to the CEO to request a transfer to the main branch. She explains that she has difficulty working in the branch office because Jung-Eun married her husband. She even pretends that this was the reason that she yelled at Hyunjoon. The CEO agrees that she deserves better and promises to get her another position. 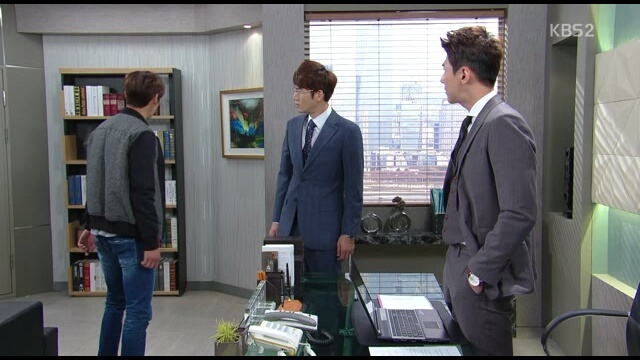 However, Heejung walks out of the office and declares that she’s going to take over the company to give to Minwoo. Heejung then goes home to see her son. She tells a sleeping Minwoo that she is sorry but she wants Minwoo to take his rightful place as the heir to YB company… She even repeats that she can do it without Hyunjoon. Minwoo wakes up and asks if his father is not coming tomorrow as he heard his father would return. Heejung answers that Jingook is not coming and Minwoo begins crying again. More news! Grandmama is returning! 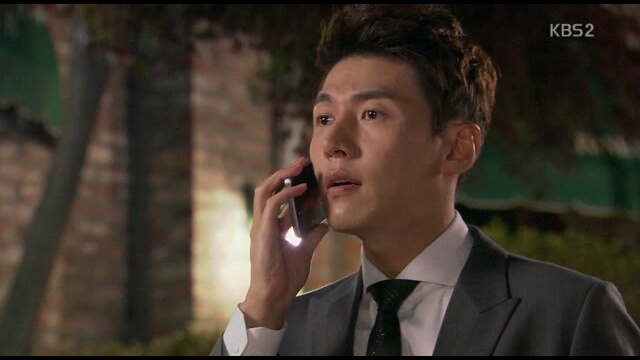 As for Hyunjoon, he gets suspicious about Ki-Chan’s less than expected reaction and calls Kayoon’s father to check in. He hears that Kayoon left first and then goes to the restaurant before calling Kayoon. However, Kayoon lies that she’s still at the office with her father and Hyunjoon catches on. He does not say anything and let’s it go. Kayoon goes inside the office where Ki-Chan is still working he tells Kayoon about meeting Hyunjoon and asks if she doesn’t regret not choosing Hyunjoon who made so much money while Ki-Chan is struggling to make even a little. Kayoon smiles that she likes good looking younger guys. The next day arrives and the newlyweds and Grandmama arrive! There’s not much I have to say about this episode since it was more of a plot developer. We see that the wedding happened smoothly and Hyunjoon realizes that getting his father’s approval is only half the battle. Perhaps it is time for Hyunjoon to turn evil. Last, but not the least, we find out that Heejung has changed her goals in life as well… She’s going to go the cliché route if corporate takeover. Let’s see where the drama team goes with this. Even a hackneyed story can become engrossing if the execution is done right.